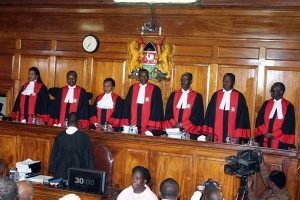 Kenya’s supreme court in session. Agencies picture. NAIROBI. Celebrations erupted in different parts of the country this morning following a Supreme Court ruling that allowed Kenya’s National Super Alliance (NASA) access to the Independent Electoral and Boundaries Commission (IEBC) servers. In parts of Nairobi Kisumu Siaya, Kakamega, Vihiga, Homa Bay, Kajiado, Mombasa and Kilifi towns, jubilant NASA supporters took to the streets to celebrate the court ruling. The Supreme Court granted NASA restricted access to select IEBC data and equipment used to conduct August 8 general election. In a unanimous decision, the seven judges of the highest court in Kenya said they had granted the petitioner orders of access because understanding how the systems work will help the court come to a fair decision. The orders were limited to only aspects that will not compromise the commission’s electoral management systems. The court, however, rejected another request from Raila Odinga, the Nasa presidential candidate, which would have allowed him to file another affidavit arising from the outcome of the system audit. Reading the ruling on behalf of his colleagues, Justice Isaac Lenaola on Monday said allowing Odinga to file another affidavit would introduce new evidence and further delay the hearing with only four days to the deadline of determining the petition. According to local media, the ruling is a big win for Nasa and Odinga who maintains that technology was used to rig the election in favour of President Uhuru Kenyatta. He has also alleged that results from some of the polling stations were relayed from ungazetted areas, and the system was configured to give a constant 11 per-cent margin between him and the incumbent. As a result, Odinga now describes Kenyatta and his deputy as computer-generated leaders, a remark described by President Kenyatta in his affidavit as demeaning. The court said the exercise will be supervised by the registrar of the Supreme Court and the court’s appointed ICT experts. Parties will also send their representatives to oversee the exercise which will be carried out at a venue to be decided by the registrar. Among other things, the court ordered the commission to allow the Nasa team access to all the servers at its disposal, firewalls without the passwords, the passwords, systems user types, and the commission’s ICT redundancy plan. The court further ordered the commission to grant the Nasa team reading devices to distinguish the authenticity of the all documents they will be offered. The report of the audit must be submitted to the court by 5 p.m. Tuesday. The parties will thereafter be allowed to make submissions on the report.